Remember the Weezer Snuggie? The band’s just blown past their previous brand-plugging efforts with an unofficial tune to support the U.S. World Cup soccer team at the World Cup. Will it help the fleet-footed squad score goals and stay alive and maybe advance and … Sweet Jesus get to a TV quick! Sorry. Remember the Weezer Snuggie? The band’s just blown past their previous brand-plugging efforts with an unofficial tune to support the U.S. World Cup soccer team at the World Cup. Will it help the fleet-footed squad score goals and stay alive and maybe advance and … Sweet Jesus get to a TV quick! Or maybe it’s a fabulous PR stunt for Weezer. Check out the band’s site–to listen to the new track for free, though, you have to log in with your Facebook details. See how that works? Weezer’s publicists get a hold of lots of lovely contact details for later promotional efforts, and it’s even great publicity for Weezer’s upcoming live appearances at summer festivals and shows. All together, buying into the unexpected feverish excitement in the U.S. about this World Cup makes for a magical strategy–almost at the levels of sophistication needed to steer a ball past two defenders and a goalie. Okay, okay, we’re being slightly cruel. 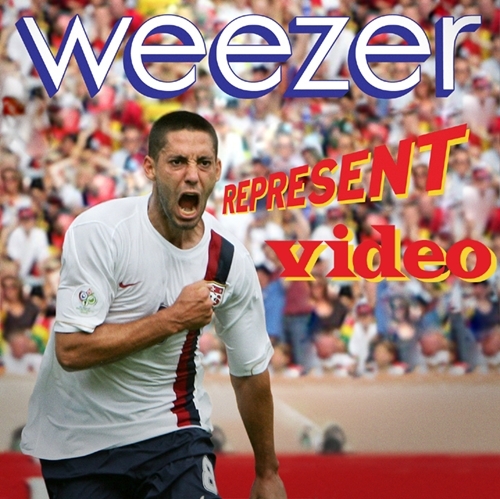 Weezer’s frontman Rivers Cuomo is a seriously crazed soccer fan, and the idea that he could write a tune to act as the “unnofficial theme song,” earn the backing of the U.S. Soccer Federation for promotion of the video on its Web site (going live today at 9:45 a.m. EST), and mix it all up in time for the 60th anniversary of the last match between the U.S. and England soccer teams in a World Cup would’ve been hugely exciting. And it’s hardly the first lighthearted, but passionately-sourced unofficial musical effort for the World Cup: Check out Fat Les’s “Vindaloo,” for the 1998 England squad. I promise you’ll be humming it for hours. Soccer, eh? It’s a beautiful (marketing) game.